Disposable Overshoes are waterproof polyethylene shoe covers that fit easily over all types of footwear. The elasticated edges make sure that a secure fit. Usually they are manufactured utilizing a deeply embossed CPE (Chlorine Polyethylene) material which can sometimes be combined with other non-woven materials for superior performance. 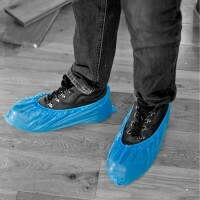 Disposable Overshoes are used to maintain hygiene and protect clean areas from contamination by germs, dirt and dust. Ideal applications for the overshoes range from hospitals, laboratories, food processing plants, swimming centres and practically any environment you wish to keep clean. Applications include: Factory vistors, swimming centres, hospitals, laboratories, clean rooms, food processing plants. An embossed CPE overshoe with elasticated edges. Latex free elasticate..